Oooooh, she’s growing too fast! My sweet baby girl turned 5 years old tonight!!! I can’t believe it was 5 years ago that she was born. I mean, I can’t remember life without her sweet giggle, but it seems like just yesterday that we met! She had some grandparents and friends over to celebrate with pizza, cake, ice cream, and pin the tail on the mermaid. And she requested a Unicorn cake. I didn’t think I’d ever be able to outdo last years cake but I may have done it! 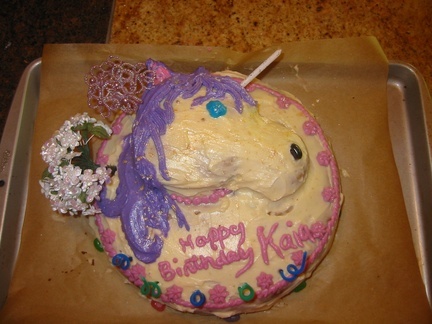 I made a 10″ round cake and 4 cupcakes, then cut and placed the cupcakes on top of the cake to form the unicorn head. The rest was done with icing. It was a Honey cake from a Winny the Pooh cook book Kaia has, and cream cheese frosting. Happy birthday to Kaia! That is a beautiful cake. I have most excellent memories of last year’s cake. Mmmmm!